The About page says: "University Herald started operating in 2011, aiming at serving as a news platform for US Universities, as well as numerous major universities worldwide." 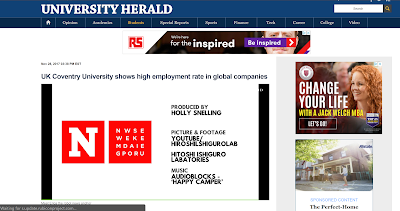 The most-recent stories are from November, 2017, and are embedded with videos from Newsweek Media Group. The post was dated June 8, 2017. It was deleted during the last few months, but I found a cache and made an archive here: http://archive.is/CrM3m. 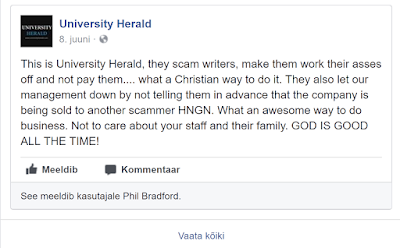 I sent an e-mail around 10:00 A.M. this morning to editor@universityherald.com and media@universityherald.com, asking if someone could verify whether the Facebook post came from an employee (or ex-employee). 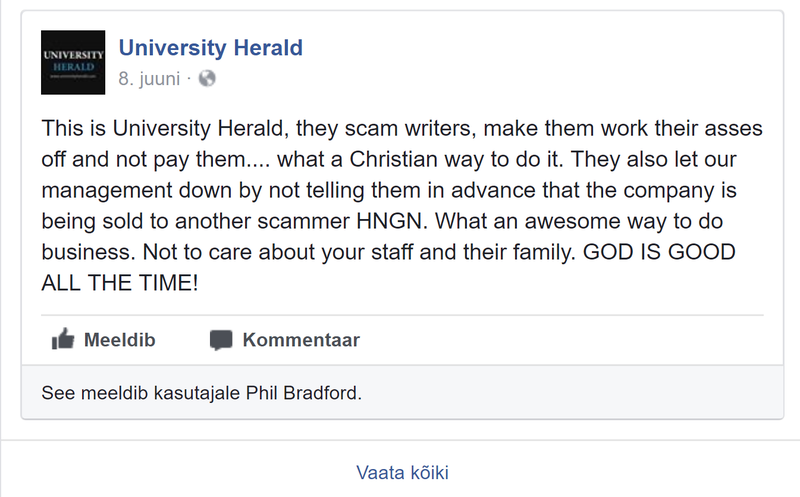 I also asked if the University Herald had fallen behind in paying their writers. I haven't heard back. The current Contact page for UniversityHerald.com shows the address 30 Broad Street, 14th Floor, New York, NY 10004. Last December, the Contact page said advertising inquiries should be sent to ads@iqadnet.com. Last September, the Contact page showed the address 10866 Wilshire Blvd. 4th Floor, Los Angeles, CA 90024. In March of 2016, the Contact page showed the address 33 Whitehall street, 7th Floor, New York, NY 10004.